It's been a while since Sofia Coppola has directed a piece of work stemming from somebody else's storytelling, dating back nearly twenty years prior to the release of The Beguiled, her latest atmospheric period thriller. From concepts that are entirely of her creation (Lost in Translation and Somewhere) to expanded dramatizations of real events (The Bling Ring and Marie Antoinette), the originality inherent in her perspective hasn't had to play by the rules of adaptation since her rendition of Jeffrey Eugenides's novel, The Virgin Suicides. Even with that one, Coppola's first directorial effort, she imparted her own techniques and thematic concentrations upon the narrative, tweaking the surreal atmosphere into something of her own. Based off a short book with alternating points of view, The Beguiled affords Coppola less of an opportunity to leave her distinctive thumbprint on the progression of events, yet her signature fluid, dreamlike style still ties together with the 1800s setting in creation of enthralling gothic suspense hinged on principles, hospitality, and jealousy. Based off the novel by Thomas P. Cullinan, which has been previously adapted to the big screen by Don Seigel, the story takes place in the south during the later stages of the Civil War. Left alone during the battle, a girls' school in Virginia currently shelters five of their students who don't have anywhere safe to go. Overseen by Miss Martha Farnsworth (Nicole Kidman) and her assistant and primary teacher, Edwina (Kirsten Dunst), they go through the motions of schooling and other activities to distract from the sounds of warfare in the distance. One day, one the younger students stumbles into a northern Union soldier, Corporal John McBurney (Colin Farrell), who has been badly wounded in battle. The student helps him hobble to the girls' school, where they tend to his wounds. As his time there progresses, the isolated girls change in their perceptions of the soldier, from fear of the enemy to different forms of attraction toward him, especially from the elder teenager student (Elle Fanning) and the two overseers. This shift in attitude creates problems in the house, opening a door for John. Utilizing a confined aspect ratio (1:66) and relishing how 35mm film deepens the overgrown setting, director Coppola pairs with French cinematographer Philippe Le Sourd -- also a notable cameraperson for Jean-Pierre Jeunet -- to capture the beautifully dense, knotted wooded area engulfing the white southern home that serves as the girls' school. With cannons echoing in the distance and both haze and humidity thickening the air, an isolated and ominous feeling slowly creeps in while makeshift teachings are interrupted by the arrival of an enemy soldier. The Beguiled strongly relies on the atmosphere of its seclusion to control the tone of what happens, leaving the women without the immediate attention and defenses of men as they're left exposed to whatever wartime issues might arise. This also focuses attention to the individual attitudes of the girls once John takes up residence, a gradient of moods that range from skepticism and nationalism to pre-teen crushes and legitimate physical attraction. This is a movie driven by palpable emotion, and it's felt immediately. 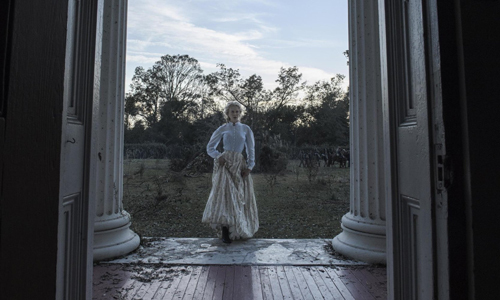 The pacing of The Beguiled functions similarly to some of Coppola's other productions, playing mostly like a mixture of The Virgin Suicides and Marie Antoinette in its leisurely, ethereal tempo and relishing of detail. What sets this one apart comes in how immediately the atmosphere evolves upon the arrival of the wounded soldier at the school, presenting a series of trials to the conflicted temperaments of the individual women, built upon their isolation, their place as courteous God-fearing southerners harboring a wounded yankee, and ultimately as women with an attractive man bound to the living space. There aren't many big, noteworthy twists and developments that occur while John's on the mend; this isn't that kind of suspense, and John certainly isn't that kind of villain. That draws attention to the little enormities of their interactions, though: glances, laughs, and shared kindnesses carry weight amid the tension mounting within the school, where the impact of allegiance and endearment complicates nearly every little decision made. Coppola has always asserted a deft touch to nuanced women caught in some form of discouragement, and The Beguiled is no exception, though she's maneuvering around several different focused personality types -- a reflection of the book's shifting perspectives -- instead of exploring the many facets of just a few. Nicole Kidman fills the role of the mature overseer and shot-caller with a similarly buttoned-up presence to the one she embodies in The Others, while Kirsten Dunst taps into the desperation and frustration of a woman whose prime years seem to be slipping away during wartime. Elle Fanning once again proves to be adept at toeing the line between innocence and seduction, embodying a significant supporting presence despite limited screen time. Even with film's focus squarely upon the women, their assorted strengths and weakening resolve, The Beguiled owes a lot to how Colin Farrell generates a flawed, mysterious energy with his gruff yankee soldier, whose motives and following decisions are intentionally difficult to decipher due to his absorbing personification of the southern women's "enemy". There's a precise, slow-boiling type of dread in The Beguiled, hanging on the many possible ways -- both benevolent and deceptive -- in which the soldier might take advantage of his favorable situation at the school, as well as how the girls could, or couldn't, safeguard themselves in the event of a confrontation. Through Sofia Coppola's careful and strategic rendition of the novel, those little budding details that compete for attention throughout the film eventually overflow with desire, envy, and spite upon its breaking point, telegraphed by the director with such a dramatically organic transition that it's tough to determine precisely when the suspense begins. Rest assured, she knows how to bring it to a proper end, where moral ambiguity and evaluating the potential dangers of a situation mushroom out of control in macabre, haunting fashion, possessing a degree of mercurial sharpness that it could've used more of beforehand. The Beguiled is a departure in tone and intensity for Coppola, yet she ensures that her artistic viewpoint and the narrative's expressive relevance remains plainly visible until the final image's lingering poignancy.